Hello friends! May I please introduce the only red dress I’ve ever made?! Can you believe it? 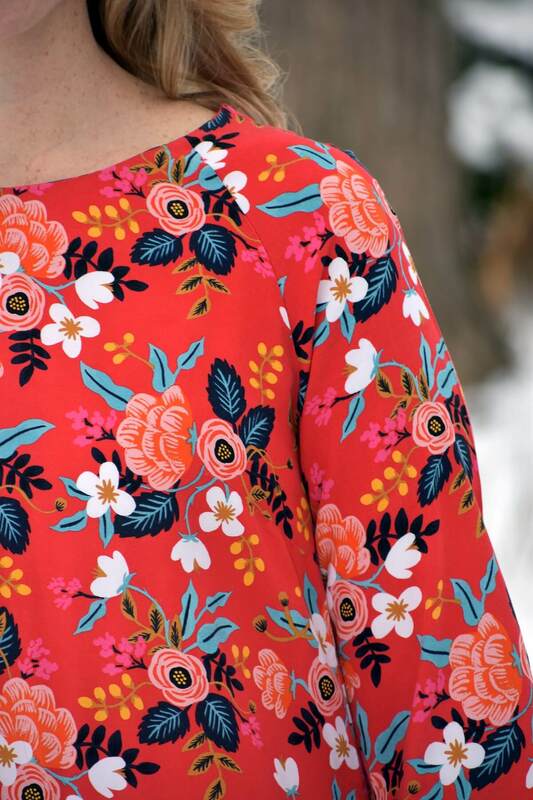 Red is just not one of those colors that I gravitate towards, but this Les Fleurs fabric was just too gorgeous to pass up. 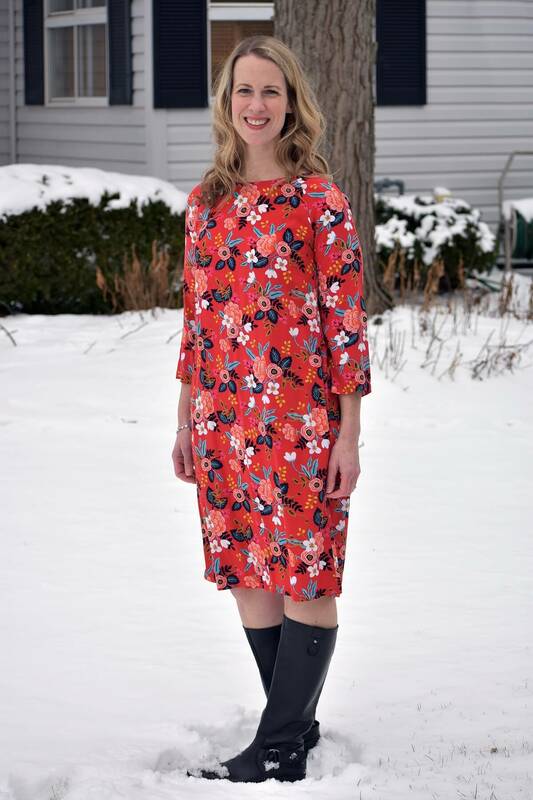 This dress is The Gathered Dress from The Avid Seamstress. I made their Day Dress last year and knew I wanted to try the Gathered Dress eventually. I love how this dress looks like a basic sheath from the front but has a bit of a party in the back! The gathered waist is unexpected and unique. I’ve had this rayon fabric in my stash since the very first collection that Cotton + Steel did with Rifle Paper Co. I bought it to make a skirt but never could decide if that was the best use for it. Truth be told, I wear so little red that I was a little scared to actually use it. 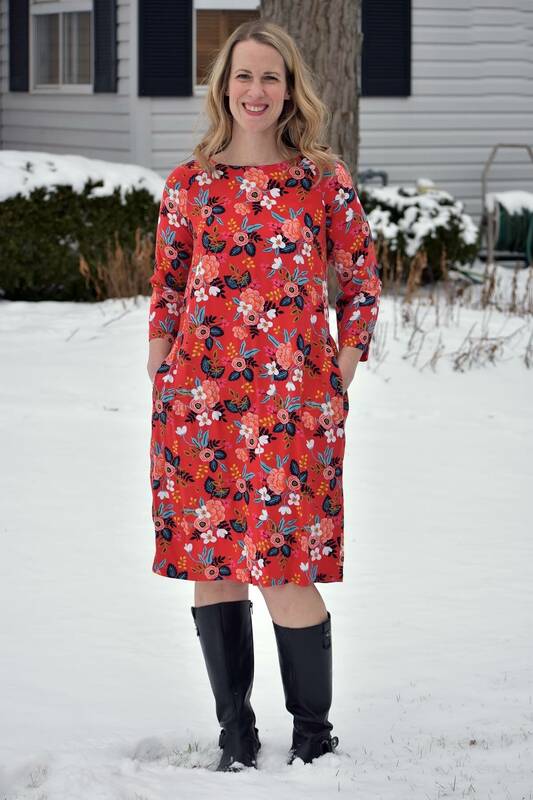 When I got the pattern for this dress I decided to jump in and use the fabric since it wasn’t doing me any good just sitting in a drawer for years. If knew that if I felt overwhelmed by the red I could always add a cardigan. My measurements put me at a size 3 in the bust and between a size 5 and 6 at the hips. I very bravely decided not to make a muslin of this before cutting into my hoarded fabric but went off of the provided finished garment measurements to determine that I should be OK cutting the 3 graded to between a 5 and 6. I decided to do a 1.25″ full sleeve adjustment based in the fact that the sleeves on my Day Dress (and basically every other sleeve ever) are a bit snug. I’m really glad I did that! The sleeves are comfortably loose with the adjustment. When I sewed up the side seams and tried on the dress for the first time I felt like the dress was too big on the front side. I had extra fabric that was sort of folding up at the side seams… and the pockets were too low. I wasn’t exactly thrilled at the prospect of having to have to unpick the side seams, unpick the pockets (which had been understitched, of course!) and slim down the front piece. But of course I did it and I’m thrilled with the result! Other than having to adjust the front piece, I had a fun time sewing this dress. 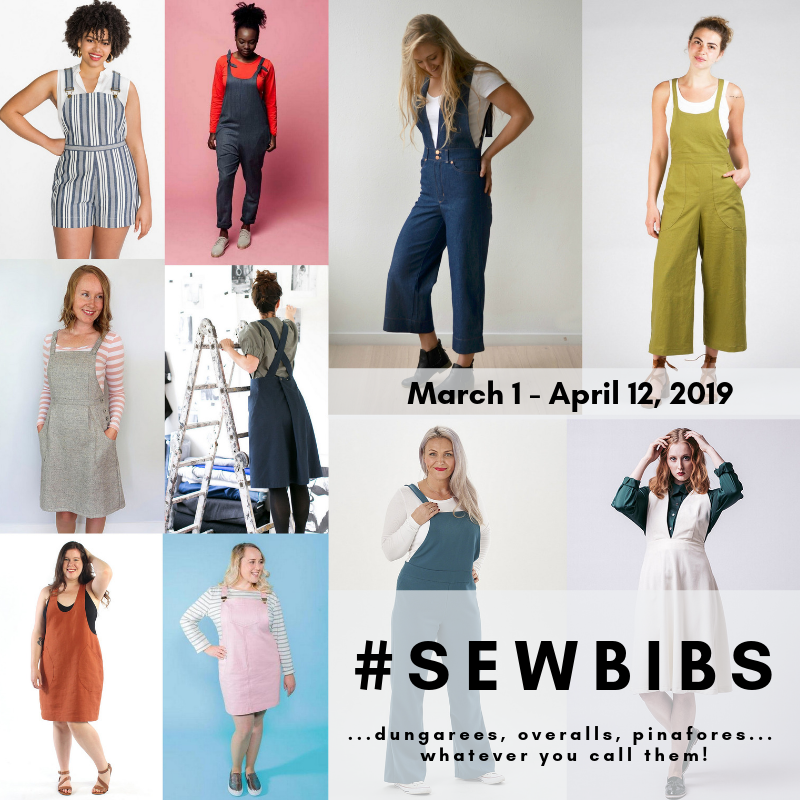 I think sewing with really beautiful fabric makes any project more enjoyable, of course, but the pattern itself is a great sew. The dress has nice, thoughtful details. There are bust darts and shoulder darts to shape the raglan sleeves. The inseam pockets are recessed a bit, which is something I’ve started doing to all of my inseam pockets even if it’s not prescribed in the pattern. I really like how the back skirt pieces are wider at the top for gathering, but taper down at the hem. It really keeps the back of the dress looking steamlined. I am used to pieces that get wider at the bottom so I did have a moment of confusion when I was cutting and I almost cut those pieces upside down. It wouldn’t have been the worst mistake with this fabric but if the print was more directional it would have been a problem. If I make this dress again I will be sure to interface along the center back of the bodice and skirt to reinforce the invisible zipper. The pattern doesn’t say to do it and I totally didn’t even think about doing it. When I wash the dress the back comes out all wavy, which is easily fixed by pressing, but it might come of out of dryer better if that area was interfaced. I feel really fantastic when I wear this dress. 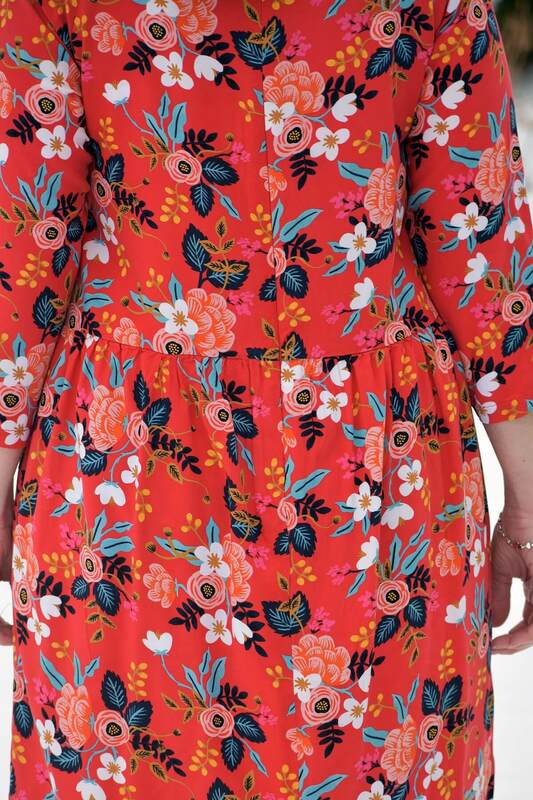 It was such a good use of this fabric, especially since the pattern isn’t broken up on the front of the dress. Now that I’ve made the dress I have no idea why I was worried about wearing this color. I think I should be more open to wearing red since I love this so much. I’m loving this print on you Teri! Thanks, Abbey! I knew I loved it but it’s a total relief that I actually love it on myself, haha! This turned out so cute! 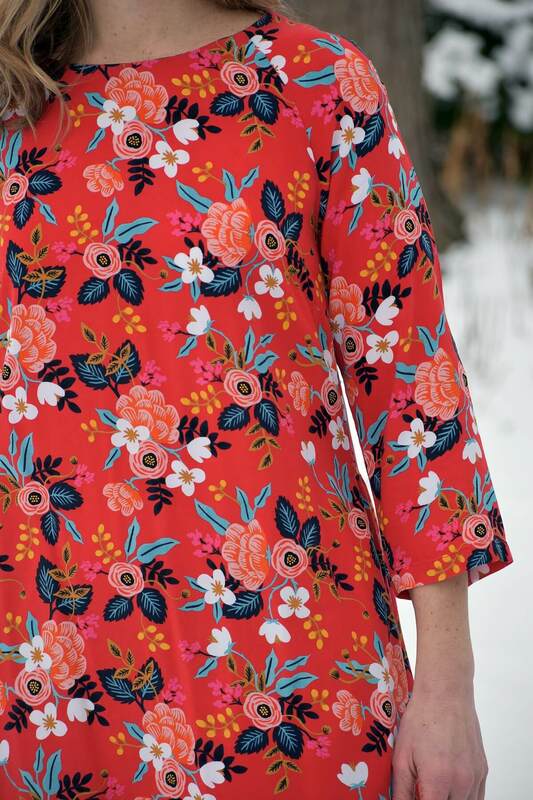 I hear what you’re saying about red–I really hesitate too, but this is such a great print. Is it rayon? I really like the pattern too. Might have to copy! Thanks, Lori! Yes, it is rayon– I should have mentioned that in the blog post but glossed right over it. 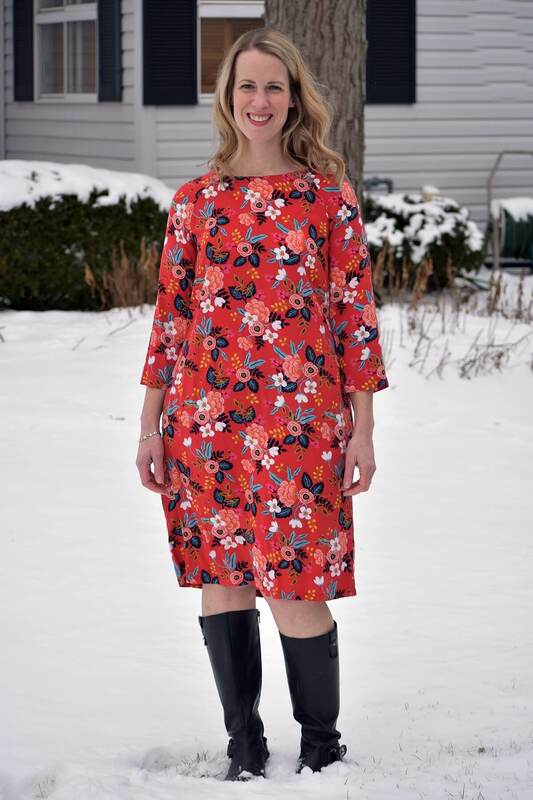 I hope you do copy it– the dress and the fabric are both great! Red looks great on you. Love the pattern. Thank you so much! I love having this red dress in my wardrobe. What a great dress! Such a fun statement piece to have in your wardrobe. I adore Rifle Paper Co designs – always fun to work with! Thank you, Mary Beth! I agree— it is a great statement piece! I have trouble not ordering all of the Rifle Paper fabrics. They are all soooo pretty and the rayons are so nice to sew with. It looks so good on you! I might check out this pattern. It’s so simple but very pretty and flattering. Thanks, Marsha! I think you’d like this pattern. It is a really lovely sew. And it’s that perfect combination of pretty and really comfortable! This is beautiful! Lovely and sleek and front, extra action in the back. I also have a skirt pattern in my to-sew queue that widens towards the top! A little disorienting if you’re used to full skirts, for sure! Thank you so much! I have never seen a skirt pattern that is wider at the top– I bet it has a very interesting silhouette. 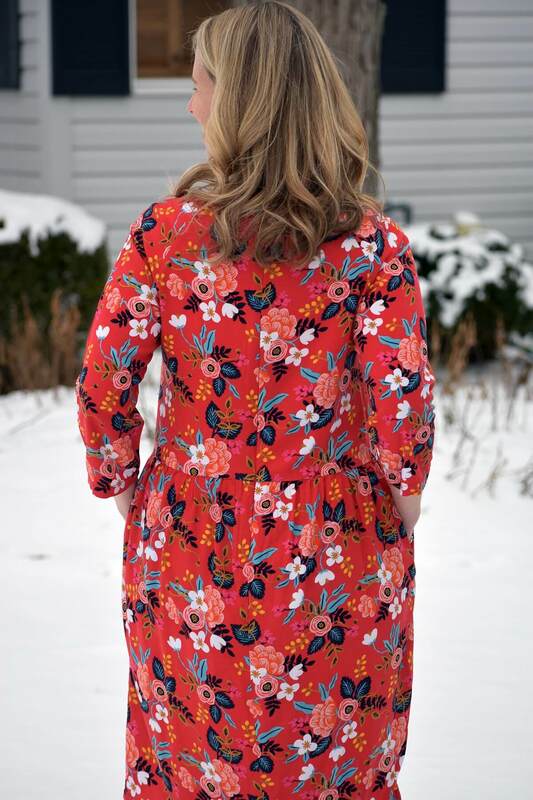 This was a really fun sew and I definitely want to make another one to wear in the Spring and Summer.